An editor said to be in the process of leaving Newsquest launched an attack on the publisher as colleagues began a week-long strike this morning. The anonymous editor, said by the National Union of Journalists to be working at Newsquest South London, hit out at the company’s “endless obstacle course” which has prompted union members there to launch industrial action. The stoppage began at 9am today and will continue until Wednesday 19 October. In a news release issued yesterday ahead of the action, the union quoted an anonymous editor in what amounted to a wide-ranging attack on the publisher. They said: “Being a journalist at Newsquest has felt like tackling an endless obstacle course designed by the company and its management. Highly respected editors with decades of experience have been made redundant and gone unreplaced, the number of reporters has been slashed annually, professional photographic coverage has been all-but-abolished, and sub-editors have been laid off and replaced with a barely functional computer programme. 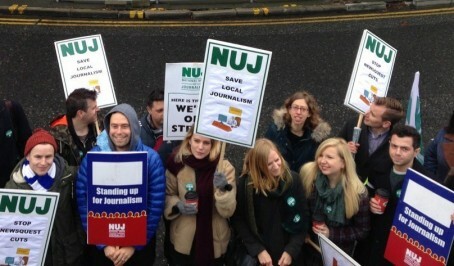 The NUJ has declined to name the editor concerned, but claims they are currently in the process of leaving one of the newspapers affected by the strike. The news release also quotes two unnamed reporters at the South London titles who it says are also in the process of leaving. A Newsquest spokesman said: “The NUJ and its members have been made fully aware of the trading position of the South London business and the need to revisit its cost base to ensure a sustainable future. Worryingly for the industry, when I worked at Newsquest, having come from Trinity Mirror I felt like I was at the New York Times in the 70s. I used to marvel at the fact they had photographers and a librarian – a LIBRARIAN! I often imagined how much fun a TM exec would have had walking around the building ‘streamlining’ processes.